In my last post, I invited you to think about what was causing a part of the Trongsa Dzong wall to be perpetually wet. “Andrea” and “YPenjor” put forward some good guesses. But, alas, modern cement is not to blame. It isn’t a hidden lake. And sub-terrain water seepage is not the cause. Nor is leakage from the rooftop. Or seepage from recent plumbing. The answer is history. Yes, history! No one could quite tell what was causing that particular part of the wall to stay wet throughout the year. And that wet patch would not be covered by modern cement or traditional clay or lime whitewash. So finally, a small part of the inner wall was broken to investigate what was causing the wall to get wet. But it turned out that that wall was not the inner wall. Instead, it revealed a secret chamber, one that was full of rock salt! Salt, as we all know, attracts moisture. And because the secret chamber stored salt, its outer wall was always wet. During the old days, when our country was closed to the outside world, salt, which couldn’t be produced domestically, was a precious commodity. All of it was imported from Tibet in the form of rock salt. Our early rulers obviously stored as much of it as possible, to be used whenever the source was cut off. The idea, it seems, was to ensure that excessive dependence did not compromise our sovereignty. If so, that idea is even more relevant today. The inner wall, and its valuable contents, has since been resealed. But the next time you visit the Chokhor Rabtentse Dzong in Trongsa, look for that wet patch. It’s on the wall facing the Taa Dzong. Imagine what other secrets lie within and behind those walls. And marvel at the great extents our leaders have gone to, to nurture and protect our national security and sovereignty. My son, Gyamtsho Tshering, 17 years, Class XI, is home for his winter vacations. My wife and I are delighted to have our family together, and have often worried that our son has had to be away from home for most parts of the year. 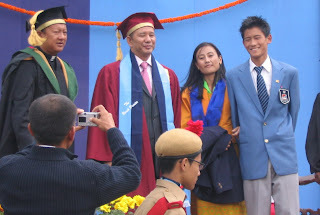 Gyamtsho studies in St Joseph’s School, also known as “North Point”, in Darjeeling, India. Why is he in North Point? Because while he was at Lungtenzampa MSS, the government decided to teach Bhutan history in Dzongkha. His mother had been seriously concerned. “Even as a subject, most students find Dzongkha difficult” she had grumbled, “so how can they use it to learn history properly?” I agreed. Plus most people, especially teachers, had complained that Dzongkha language teachers wouldn’t know enough of history to teach it, and most history teachers wouldn’t be able to teach in Dzongkha. So we sent him to Darjeeling, despite the emotional and financial hardships. Now it looks like 10 researchers contacted 96 schools and 15,000 students to establish what most parents have known all along – that teaching history in Dzongkha may not be such a good idea. I hope that the government takes the research findings seriously and acts quickly to undo years of damage. But some of the damage can’t be undone. If, as the researchers conclude, teaching history in Dzongkha has failed, then, we must accept that, in the last three years, thousands of our students have learnt little history and they probably now dislike Dzongkha even more. Not good for the students. Not good for our national language. Not good for our country. As for our son, we have not regretted. He receives a well rounded education in North Point, where academic standards are high and a premium is placed on values, sports, music, art, social work and leadership. And guess who the principal of North Point is? Father Kinley, a Bhutanese! Five years ago, he was sent to revive North Point, a school that had deteriorated over the years. His challenge was to turn the school around. His tool was complete authority and autonomy to do so. And in five years, in spite of the political turmoil there, he has more than turn the school around. Father Kinley’s efforts are already being recognized – Educational World Magazine recently declared that North Point as one of the top 10 residential schools in all of India. It’s obvious. Bhutanese teachers are capable. Give them the right incentives, some support and a little authority and autonomy, and they will deliver. And remember, good heads make good schools.